Lately, I’ve been fairly cheap with my money. Don’t get me wrong, I LOVE to shop but now, shopping for me means looking – and not always buying. Trust me though, I wasn’t always this way. In college, if I got a bad grade or my relationship of the month didn’t pan out, I’d go shopping and spend a good chunk of my student loan money on clothes. Thanks, Sallie Mae. Don’t worry though, I am paying for it now. Oh, am I ever. Ever since we bought the house, and every single penny of our savings went to furnishing this house, I have been looking for ways to cut costs. I started couponing a little (which makes me feel like an old lady for some reason), taking lunch to work, and only buying items that I either NEED or LOVE. This makes clothes shopping not very fun at all – it’s actually kind of depressing. But, I’ve saved a good amount of money by doing it. In addition to the little changes I’ve been making, I also started trying new recipes for items that I normally buy at the store. I’ve come to find out that convenience comes at a cost, and the extra few minutes it takes to actually make something instead of buying it is so worth it. The Easy Banana Bread I made cost me approximately $1.50 to make, whereas buying it at the supermarket would be well over $5. May not seem much, but over time that $3.50 adds up! Which brings me to this homemade “apple” sauce. I saw this recipe on a blog I follow called Money Saving Mom, and even though I am not a mom, I am striving to be a better money-saver. She’s got some great ideas, and this recipe was one of them. The farmer’s market ManFiancé and I frequent usually has great prices, and if some of the fruits or vegetables are starting to turn, their prices are even cheaper. I got a whole bag-full of browning pears for $1 (! ), and decided to put them to use. Set your slow cooker on high. 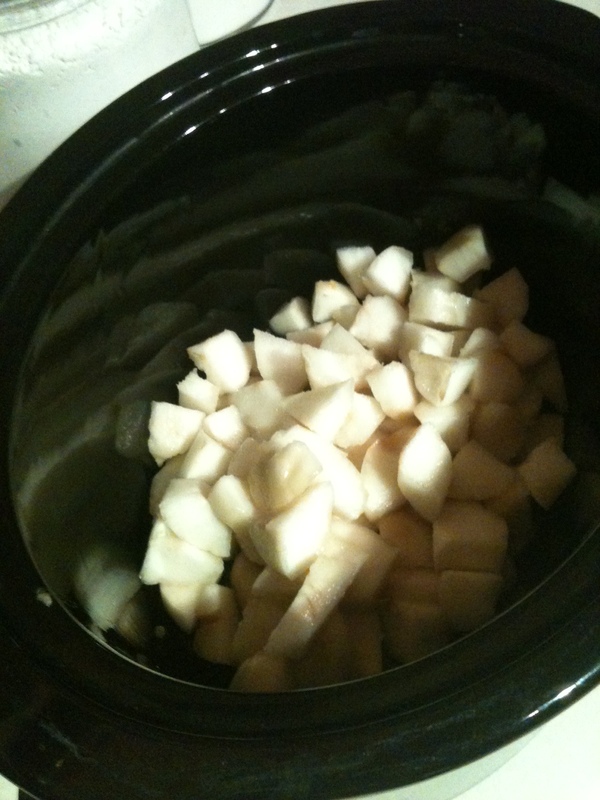 Skin, cut up the pears, and place in a slow-cooker with a 1/2 cup of water for every 5-6 pears. Then, add cinnamon to your liking. 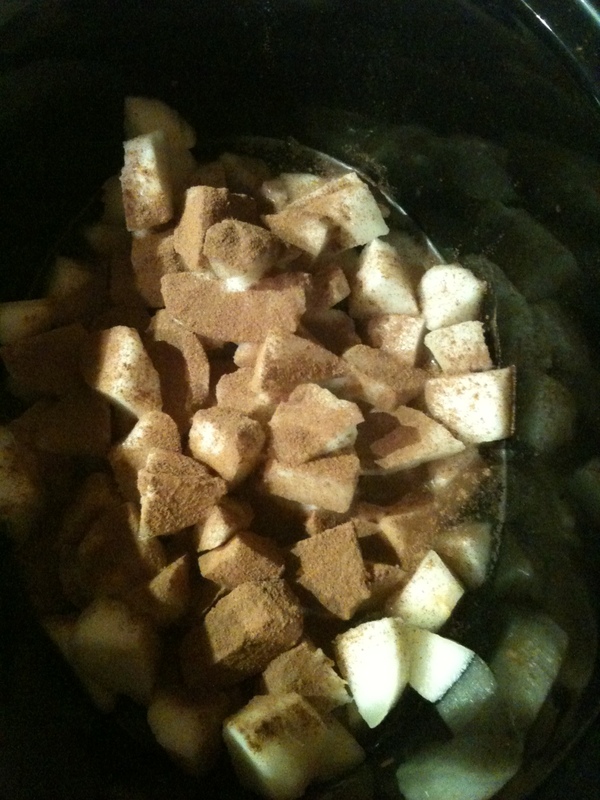 I tend to be heavy-handed with the cinnamon. After 5 hours (even if it’s past 5 hours, it won’t hurt it), drain the excess water from the pot. 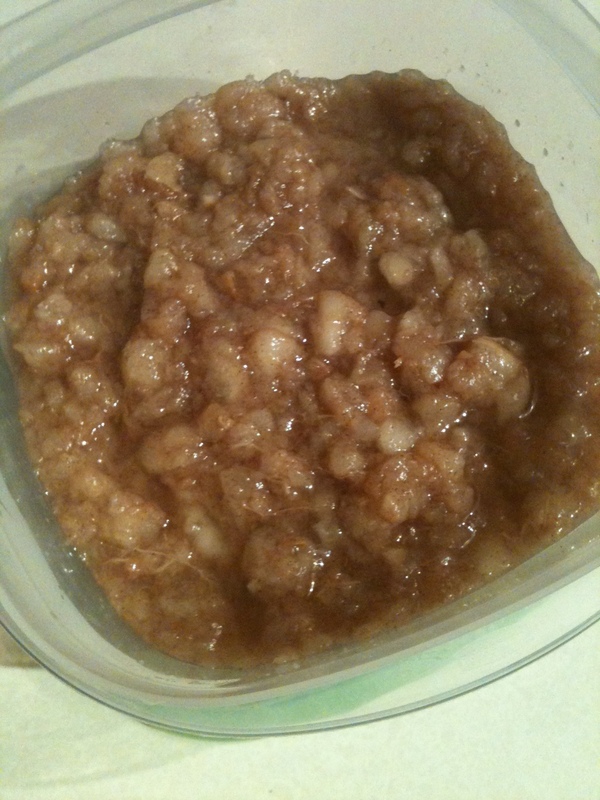 Place the “apple” sauce in a sealed container in the refrigerator to let cool. Done! So easy, so cheap (about $1.25), and so so delish! Do you have any good homemade recipes to share? Please email me at saltedchocolate@live.com, or share in the comments below. I’d love to try what you’ve got! This sounds awesome – as you can probably tell I’m all about eating well for cheap. If you want any more recipes I have amassed quite a few! WOW that sounds and looks good, something new for me to make, thanks Ray!! Love ya!